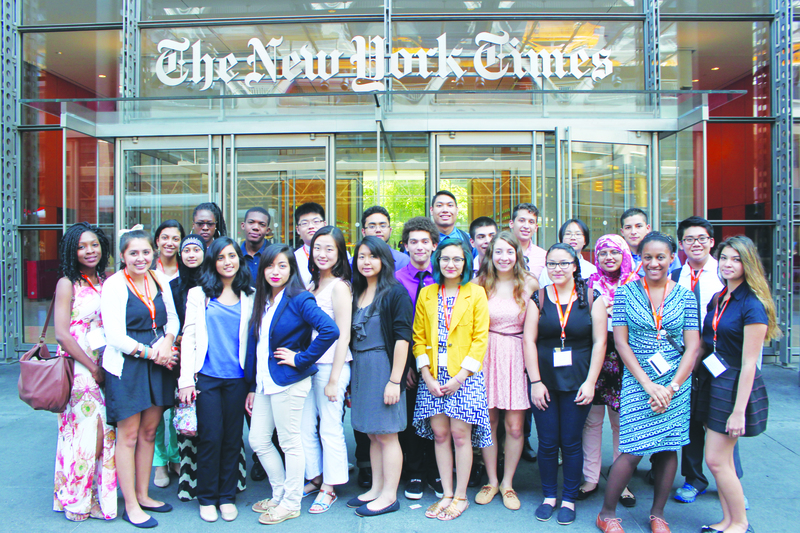 Ten days ago, we arrived at Princeton University for the start of the Summer Journalism Program. We came from all over the country with different backgrounds and cultures, but we shared a common interest in journalism. Today, we leave Princeton as friends and as members of the broader SJP family. We have had a once-in-a-lifetime experience and formed long-lasting friendships cemented through long days of workshops and late nights in the newsroom. Our days were typically 19 hours long and filled with back-to-back workshops in which journalists, professors and administrators spoke to us about a variety of subjects. We had the chance to learn about different aspects of journalism, the University and some of its most interesting professors. We also had many challenging and memorable opportunities to practice journalism, from conducting interviews on the streets of New York City to reporting from the press box of a National Football League preseason game. We appreciated the workshops that were dedicated to teaching us about the college application process. Before coming here, many of us were not informed about all the components of the college application process. The counselors who have been assigned as our mentors will be a huge advantage to us in the upcoming months during the college application process. We came into the program thinking that Ivy League colleges were out of our reach, but the counselors and directors have helped us realize that we are talented and should aspire to attend top colleges. To be sure, nothing is perfect, and the program does have its flaws. The long days left us sleep-deprived, and the lack of breaks made it hard to focus on every speaker. In addition, the prohibition on cell phones during the day was a difficult transition for us because we are a generation who check our phones constantly. We soon understood and came to appreciate this policy, however. Instead of pulling out our phones during breaks, we were able to immerse ourselves in the program and connect with other students. Just as the directors had hoped, the lack of phones encouraged us to participate in intellectual debates and conversations with our peers. All of our amazing experiences would not have been possible without help from donors, so we extend a thank you to everyone who supports SJP financially. The directors deserve another thank you for organizing the program and its workshops and ensuring that everything ran smoothly. Thank you especially to Michelle Kiyeon Kim who did an amazing job as this year’s intern. Finally, a thank you to the alumni counselors who provided us with many lessons to take with us as we apply to colleges. We know that there is a difficult road ahead of us, but thanks to this program we are ready to take on the challenge. This entry was posted in Opinion, Staff Editorials and tagged College, Higher Education, Journalism, SJP2014 on August 11, 2014 by pusjp.